Bad breath(Halitosis) is mainly due to the commensal bacteria present in our oral cavity, Bad breath can be usually noticed early in the mornings just after you get up known as ‘Morning Mouth‘, all the changes occur in the mouth during sleep as there is no chewing or intake of water the bacteria get sufficient time to settle down and undergoes metabolism and produce waste products of the metabolism which give out such a bad odor that our mouth stinks when we get up in the morning. Many people feel that they are having good oral hygiene and they cannot come to a conclusion on “Hoe do you get Bad Breath”. The bad odor coming out of our mouth is mainly due to the excreta of the commensal bacteria present in our oral cavity, they produce many organic compounds during their metabolism, these end products cause the bad breath in mouth. External agents: some external agents like Garlic consumption, cigarette smoking, chewing tobacco etc, repeated consumptions cause bad breath. 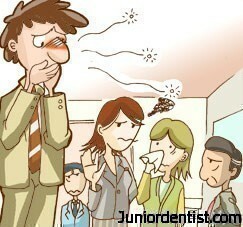 Bad Breath after Wisdom Tooth Removal: Bad breath is cause after wisdom tooth removal or after extraction of any tooth. this is because after extraction we do not clean the region properly and food accumulates there to cause bad breath. Drinking pleanty of water daily is best prevention technique to most of the diseases. Dry coriander can be chewed throughly. After meals chew one clove for 5 mins this really helps. You can chew ani seeds after meals. 2 spoons of mustard oil and salt mixed together and put in mouth and pass it from one end to the other and spit the saliva after sometime. and can u pls elaborate more on its cure.. The most common location for mouth related halitosis is the tongue.Tongue bacteria produce malodorous compounds and fatty acids, and account for 80 to 90% of all cases of mouth-related bad breath.